TULARE COUNTY – There may not be an easy way to correct subsidence in the largest canal serving the east side of the Valley, but there may be an easy way to work over it. 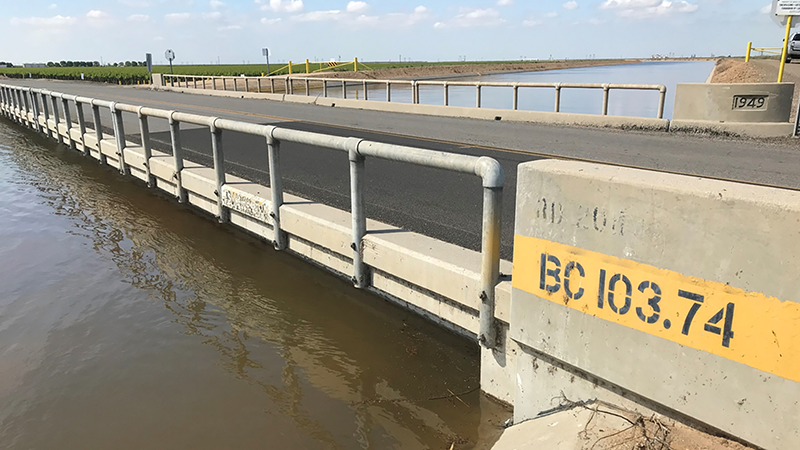 At its Jan. 8 meeting, the Tulare County Board of Supervisors approved a memorandum of understanding (MOU) with the Friant Water Authority (FWA) to allow five county-owned bridges crossing the Friant-Kern Canal to be partially submerged to accommodate increased water flows down the canal. The five bridges cross the canal near Terra Bella. More specifically, the bridges are where the canal intersects Avenue 96, Road 208, Avenue 88, Avenue 80, and Road 192. DeFlitch said Lindsay-based FWA will raise the sidewalls of the canal between Terra Bella and Pixley by two to three feet to restore water flow capacity lost to subsidence during the drought between 2012 and 2017. The Friant-Kern Canal is owned by the U.S. Bureau of Reclamation but is operated by FWA. It carries surface water released from Friant Dam northeast of Fresno 152 miles south to Bakersfield. The gravity-fed canal was designed in the 1940s to drop 6 inches every mile and convey water without the use of pumps. At the height of the drought in 2014 and 2015, FWA did not have enough surface water behind the dam to meet the needs of its members, forcing cities, water districts and farms to rely heavily on pumping water out of the ground. The problem is most pronounced in the Deer Creek region between Terra Bella and Pixley. At one point, the canal dropped five inches in five months, illustrated by canal water almost lapping up against the bottom of a bridge on Avenue 96. The more than 3 foot drop in as many years reduced the flow of the canal by 60% from a average flow of 2,500 cfs to 1,600 cfs, effectively cutting off supply to the lower third of the canal’s water users. Over the next two months, DeFlitch said FWA will add a rubberized material to the top of the canal to extend its lining and increase its capacity by 300 cubic feet of water per second (cfs) in this sunken section. Work needs to be completed before late spring through summer when dam releases are the primary source for water for 1,500 small farms and several communities, including Lindsay and Strathmore. “The bottom and sides of bridges will be soaked for one or two months during peak delivery,” said DeFlitch, but the MOU allows for pressure flow conditions for up to six months of the year. While FWA did re-seal some of the old linings throughout this stretch last year, DeFlitch said this is the first effort to increase flows through the area. He said work will begin soon to seal all of the joints around the bridges, add a waterproof coating to the undercarriage of the bridges, and apply anti-rust coating to all exposed steel surfaces of the bridges. In March 2017, FWA and their engineering consultant, Stantec Inc., conducted a field review of all five bridges and performed a structural analysis to evaluate the stability and structural capacity to withstand pressure flows. Results of the analysis indicate that all five bridges are stable and have sufficient structural strength under pressure flow conditions. However, FWA has developed a list of mitigation measures to ensure the bridges are not damaged or experience deterioration at an accelerated rate. As part of the agreement with the county, FWA monitor the bridges for settlement and debris every six months, patch areas where concrete is chipping or delaminating, conduct independent inspections and reporting of bridges every six months, and provide assistance with load rating analysis. Under the MOU, FWA is responsible for all preventative maintenance work on the county-owned bridges for the next 10 years. After the 10-year term, FWA is expected to implement a long-term solution to the subsidence problem. DeFlitch said FWA is in the planning stages of two, long-term fixes to the collapsed portion of the canal. One is to build a parallel waterway to bypass the subsidence and the other is to widen the existing canal to flow water over and around the depressed areas.